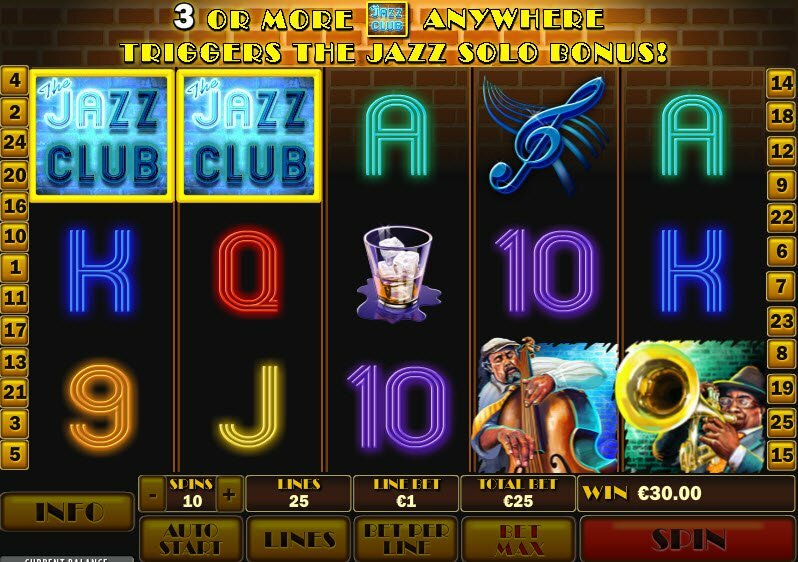 If you’re into the sax or some jazzy tunes on the trumpet, then the Jazz Club Slot Machine will surely satisfy. Powered by the Playtech software platform, this online slot game takes you behind the doors of a late night jazz club. The reels contain musicians and music notes along with opportunities to win bonuses and big bucks! 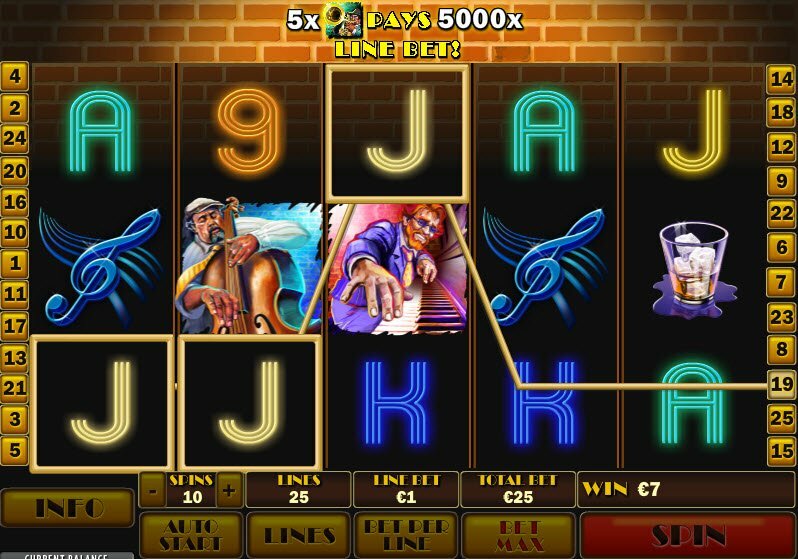 With 25 paylines, The Jazz Club Slot Machine pays homage to the great American art form known as jazz music. The graphic quality doesn’t impress, but at least you’ll enjoy the theme. 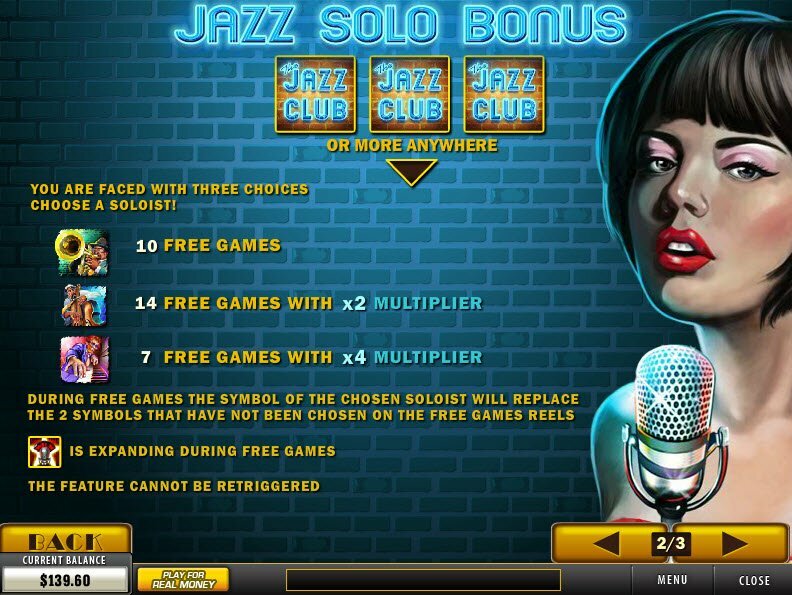 In addition, the Jazz Club Slot includes a Jazz Solo Bonus where you can choose among three different bonus prize packages. To put it blatantly, you won’t be thoroughly impressed with the graphics in the Jazz Club Slot Machine. That being said, the slot reels achieve the goal of creating the atmosphere of a downtown jazz club. Reel icons contain pictures of jazz musicians, music notes, and whisky on the rocks. You’ll hear drum solos accompany as the reels spin. However, overall the graphics need a lot of improvement. QUOTE: If you land on three of The Jazz Club icons, you can choose between 3 different bonus prize packages. The first package includes 10 Free Games, the second rewards 14 Free games with a X2 Multiplier, and the third contains 7 Free Games with X4 Multiplier. If you land on three of The Jazz Club Slot bonus icons, you can choose between 3 different bonus prize packages. The first package includes 10 Free Games, the second rewards 14 Free games with a X2 Multiplier, and the third contains 7 Free Games with X4 Multiplier. During the Free Games, the symbol of the chosen soloist will replace the two symbols that have not been chosen. Then the microphone icon becomes an Expanding Wild. In addition to this bonus feature, the Jazz Club Slot Machine includes a Wild Symbol which substitutes for all symbols except the Scatter.